We provide services for both Bethel students and employees at the Anderson Center on the 5th level. A drop box is now located on the main campus across from the campus store. Payments made using the drop box will be posted to your student account by the end of the next business day. You must have your Bethel ID card present to use any services. Please include your Bethel ID number with your payment. Make Your Bethel ID Card the Only Card on and off Campus! You have enough to worry about in college without having to stress out about your finances. U.S. Bank makes it simple. Open a U.S. Bank Student Checking account and link it to your Bethel ID card, making it your Campus ID and ATM/Debit Card—all in one. 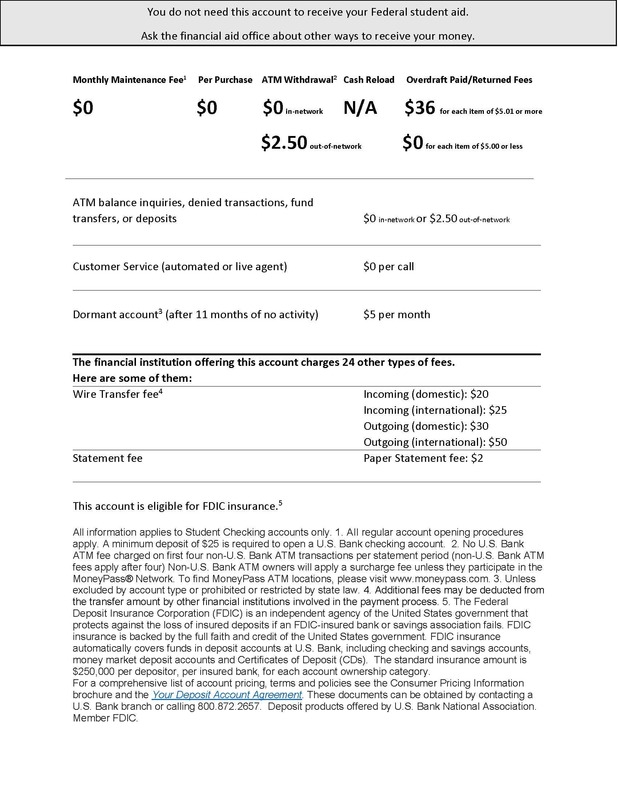 We've made it convenient for you to manage your money with a great checking account for students. Learn more about U.S. Bank! For your convenience, U.S. Bank has an ATM in the Brushaber Commons outside the campus store and has 15 branch offices in St. Paul, including two that are in close proximity to Bethel's campus. Your school chose U.S. Bank as its partner to offer students, faculty, and staff the option to add banking functionality to the campus ID card. Students, faculty, and staff are not required to open an account with U.S. Bank to receive or use the campus ID card for other campus services. For details, refer to the contract and addendum governing the partnership between U.S. Bank and Bethel University. For information on the number of students with accounts and support received during the past school year, please refer to the data required by the Department of Education.